A team of scientists from the University of Alberta’s Ingenuity Lab in Canada have used 3D printing to create a leaf structure made from natural proteins and a printable hydrogel material. The project, says the team, brings them one step closer to creating an implantable 3D bioprinted organ. In actuality, the 3D bioprinted leaf structure is more than just 3D printed, as the researchers have actually used a 4D printing technique for the bioprinted object, meaning that the leaf is able to physically react to different environments and materials. 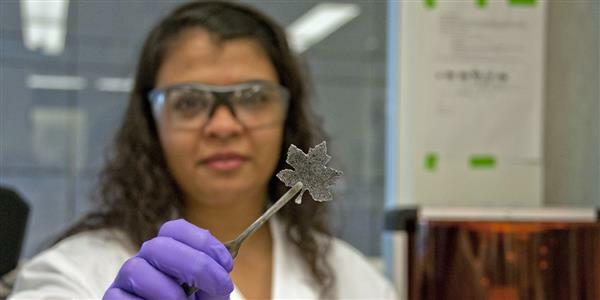 The small leaf shape was 3D printed from a special resin made from silver nanoparticles, carbon nanotubes, and a membrane made of proteins. When the 3D printed leaf is submerged in water and exposed to a UV light, the materials in it react with the water and split the water H2O molecules to create hydrogen. According to the researchers, this reaction gives the bioprinted form the same function as a hydrogen fuel cell, which produces heat, energy, and oxygen. From a physical standpoint, the leaf begins to swell when it is submerged in water and subjected to a UV light. The 3D printed leaf-shaped structure effectively demonstrates the ability to produce customized hydrogen fuel cells in a cost efficient manner. This in itself is exciting, but the researchers see the project as fitting into the bigger goal of 3D bioprinting implantable organs. Currently, the Ingenuity Lab team is also working on 3D bioprinting a meniscus, which is the cartilaginous tissue that absorbs shock and protects your knee. Most people who have knee problems or knee pain will probably know all about the meniscus. Existing treatments for a torn meniscus involved implanting tissue which has to be sized to the patient—usually during surgery. By being able to bioprint a custom-fitted meniscus tissue, Mathews says that knee surgery times could be greatly reduced, resulting in an easier recovery for patients.